Our school principal is Mr. McCarthy and he also teaches 4th, 5th and 6th classes. Our deputy principal is Mrs. Connelly and she teaches Junior & Senior infants. Mr. O'Donovan teaches 1st, 2nd and 3rd classes. Ms. Keane is one of our Special Education teacher. Ms. Pyburn is also a Special Education Teacher, and shares her time between Union Hall NS. and Maulatrahane NS. 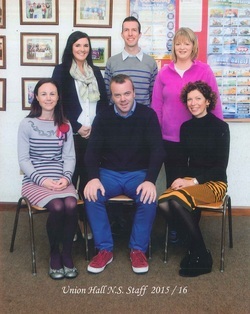 Ms. Whooley is also one of our Special Education Teachers and is based in Castlehaven NS. and also shares her time with us. We have one SNA in our school – Jenny.